They sprang out of their cars, still holding the cups of coffee that propelled them through the long Saturday morning drive. 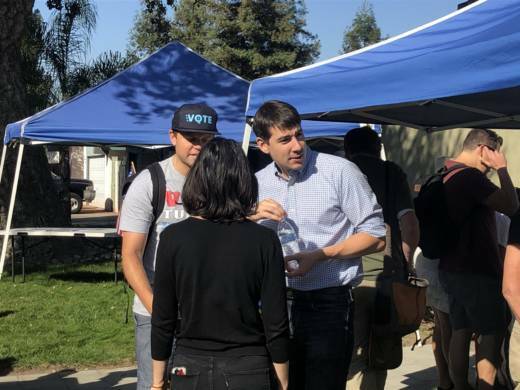 Gathered on a lawn in the Stanislaus County city of Turlock, hundreds of volunteers waited for marching orders to knock on doors and canvass for the local Democrat running for Congress, Josh Harder. Many came from the Bay Area, driving over the Altamont Pass to help flip a closely-contested House race. With all of their local seats solidly blue, Democrats in Oakland, Berkeley, San Francisco and the Peninsula have eyed California's 10th district race as their best chance to make a difference in the national balance of power. "That's why we're out here," said Judy Durkac, from San Carlos. "This is our sister district, meaning our closest district that is more conservative and red that we're trying to turn blue." From the day-trip foot soldiers to the pipeline of campaign contributions, and attack ads flooding local airwaves, it's clear that the Bay Area — its people, money, and image — is playing an outsized role in the 10th District election. 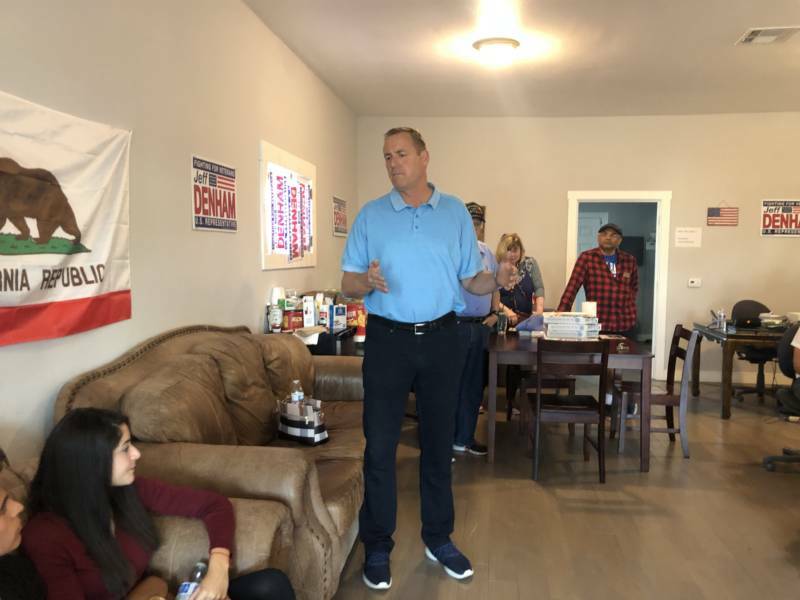 Rep. Jeff Denham, a Republican, has represented the area since 2011. But Democrats have a registration advantage in the district, which voted for Hillary Clinton over Donald Trump in 2016. Most the out-of-town door knockers followed a similar path to their newfound activism: Shocked by the result of the 2016 election and the subsequent actions of the Trump administration, they scanned Congressional maps to find the closest block of red. "After seeing what's happening, I needed to get off the couch and go out there and do something," said San Mateo resident David Leventhal. "I got in the car and drove to a district where being active would make a difference." Groups like Swing Left have aided Bay Area residents in that effort. The platform helps people find their closest swing district, and organizes volunteering and fundraising for Democratic candidates. Swing Left and allied groups have raised over $700,000 for Harder, more than any other candidate in the country. Data from the Center for Responsive Politics shows that just over 2 percent of donations to Harder came from individuals in the district, compared to 18 percent for Denham. And the top metro areas for individual donations to Harder's campaign are San Francisco, Oakland, and San Jose. Out-of-district fundraising is not uncommon in a closely contested race like the 10th district. In fact, the top origin of all donations to Denham's campaign (including contributions from individuals and PACs) is Washington, D.C. But Republicans have seized on the boogeyman of the 'Bay Area' in an attempt to stave off the toughest challenge of Denham's career. "Josh Harder, his heart may be in San Francisco with Nancy Pelosi," warns a recent ad from the National Republican Congressional Committee. "But his hands in the Central Valley are on your wallet." Addressing a group of supporters at his campaign headquarters in Banta, Denham wasted no time in downplaying the apparent energy behind his opponent's campaign. “It’s a big difference between busing people in from Berkeley and San Francisco and Oakland and those who are actually right in our community, that go to school here, work here, live here, and know how important our water is," he said. San Joaquin County Republican Party chairwoman Mary Park said she's grown weary of running into volunteers from what she calls "the other side of the hill." "I consider our side of the hill more family-oriented," she said. "In the Bay Area, let's just say they have their own way of living." 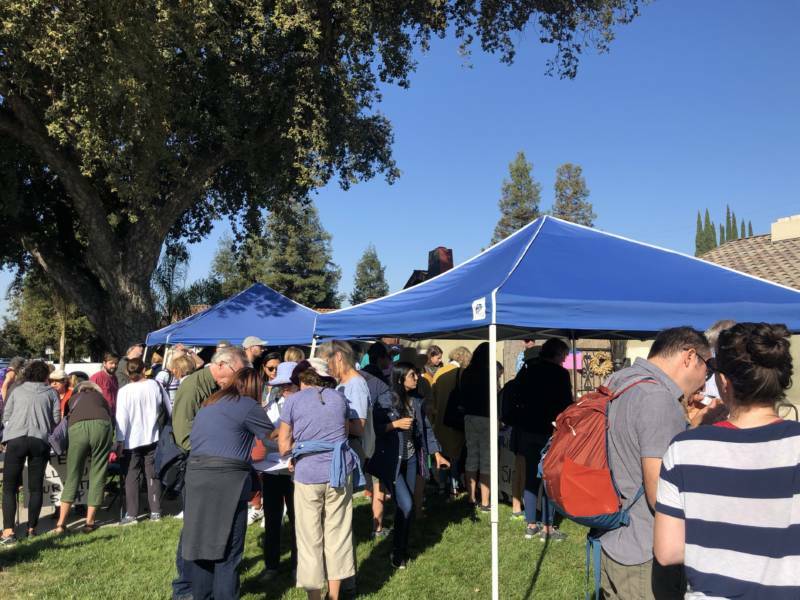 It's clear that being a "homegrown" candidate has an added level of importance in the 10th District, where many residents feel that politicians in Washington and Sacramento have overlooked community concerns. The slogans for Harder ("Of the Valley, For the Valley") and Denham ("From the Valley. For the Valley.") aim to drive home their local bonafides. At a campaign stop at an almond grove in Hughson, Harder was more focused on connecting with voters in Oakley than donors in Oakland. "I think we're running a Central Valley race on Central Valley issues," Harder said. "I'm a product of the Central Valley for five generations." His stump speech revolves around immigration and water (issues dear to this agricultural district) with an added focus on health care, a priority for Democratic candidates nationwide. Health care is also a motivating factor for many of the out-of-town volunteers lining up to knock on doors for Harder. Oakland resident Cody McMurtry said that votes like the one Denham took to repeal the Affordable Care Act show that decisions made by a congressman in Modesto aren't limited to the district's borders. "The current representative here voted to take away health care from people in this district, but it's also my parents and it’s also people I know," said McMurtry said. "Federal policy affects everyone." And while volunteers like McMurtry will jump on Interstate 580 to head west, toward home, at the end of the weekend, there's evidence that the populations of the Bay Area and Stanislaus County are becoming more connected. A new study from the Terner Center for Housing Innovation at the University of California, Berkeley and BuildZoom found that the Modesto area was the third most popular destination for households leaving the Bay Area between 2010 and 2016. "For the lowest-income households who moved out of the Bay Area, they were more likely to stay in the state but move to more affordable places," said Elizabeth Kneebone, Research Director at the Terner Center. The report found that low-income workers likely left the Bay Area to find more affordable housing, "while trying to maintain proximity to family, friends, and their broader social circle." Those connections could strengthen the 10th district's ties to the Bay Area far beyond the mid-term elections.